Summary: They were born 108 years apart, one growing up in poverty and the other with great wealth and privilege. Yet Abraham Lincoln and John F. Kennedy had a remarkable number of things in common. Both were named for their grandfathers and had seven letters in their last names. Both served in the House of Representatives, elected exactly 100 years apart (1846 and 1946), and both lost the race for Vice President before being elected President in 1860 and 1960. The two men had somewhat tragic private lives, each losing a child before being elected President and another when he was in the White House. Lincoln was determined to end slavery while Kennedy worked for civil rights legislation. And, of course, both had their presidencies and their lives cut short by an assassin: each one sitting next to his wife who wasn’t injured; by a man who used three names and was killed before his trial; and succeeded by a President named Johnson. Back matter includes presidential accomplishments, trivia, and quotes from each man, a glossary, and sources. 40 pages; grades 1-5. 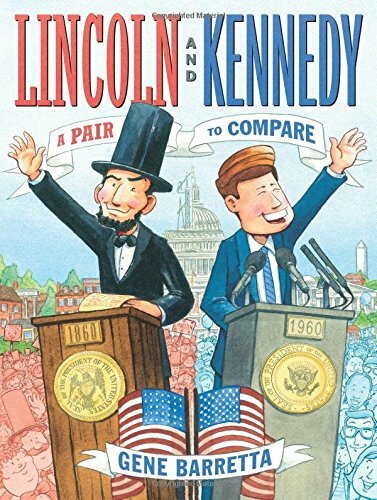 Pros: Biographical information is presented in a fascinating manner; this book could be the inspiration for students to research and compare two other presidents.